I must say, it’s terrific fun to try so many new recipes. At this time of year, I’m thinking of what end-of-year gesture I can make to colleagues. The idea of baking some cakes and biscuits for everyone to share is the most appealing – it’s fun for me, enjoyable for them, and does away with the overly-commercial (and superficial) pressure to buy and give a zillion unwanted gifts. 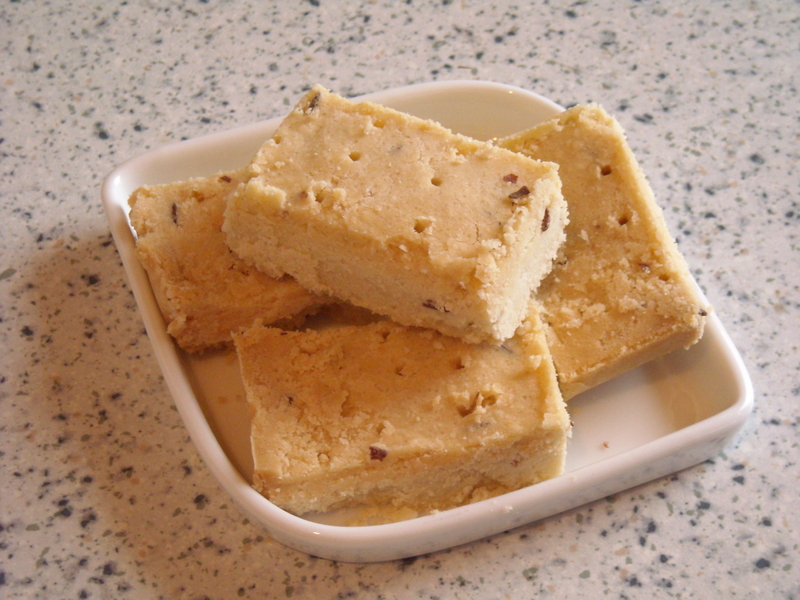 Isabella Beeton provides a simple recipe for shortbread (see bottom of page). I’ve never thought of making this before (I mean, doesn’t it just come in a Walker’s box?). But, as it’s so tastily festive, I added it to my little list of goodies to bake this weekend (I’m going on holiday after this week). Step 1: Cream the butter (by-the-by, have you ever noticed just how heavenly the smell of butter really is? Usually I use it at fridge temperature and in small quantities but, as a lot is required for shortbread, I found myself beating a larger-than-usual quantity. The scent is creamy, sweet paradise. 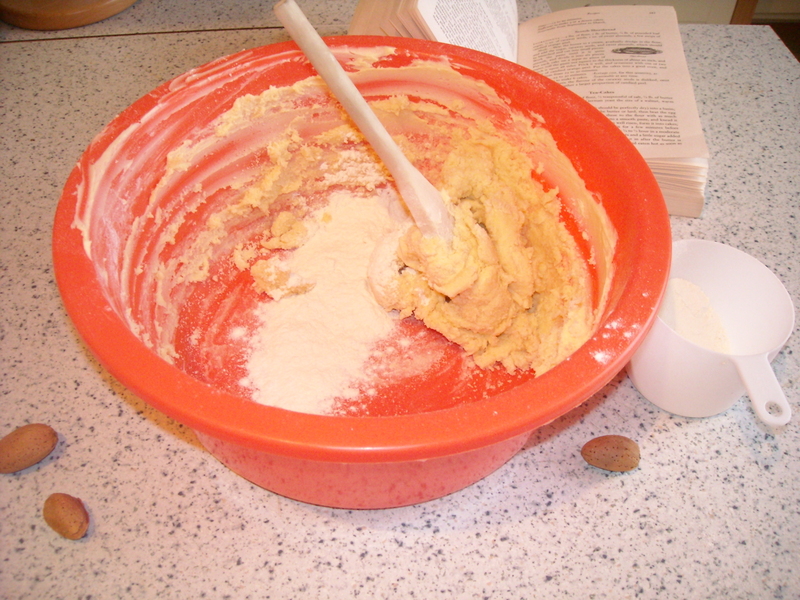 Step 2: Gradually incorporate the flour and other ingredients. 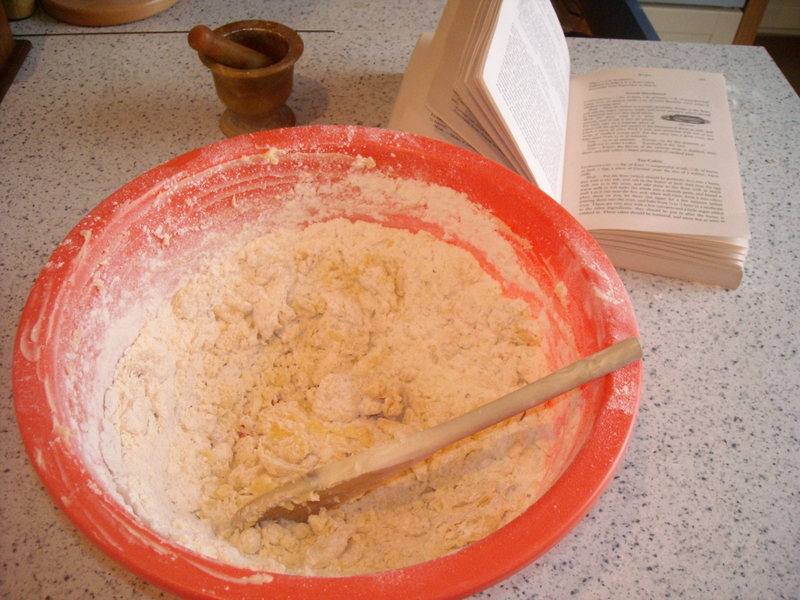 Isabella describes the result as a ‘paste’, but I ended up with a clingy, crumbly mixture. Unfortunately I don’t have kitchen scales, so measurements were converted into cups (1 cup of flour = 120 grams and so on…). However, the mixture stuck together when I pressed it into a square tray and pricked it all over before baking. Step 3: Slide the tray into the oven and drool in anticipation for 25 minutes. The recipe calls for ‘a good oven’ temperature; so I opted for 190 °C, which worked out just fine. 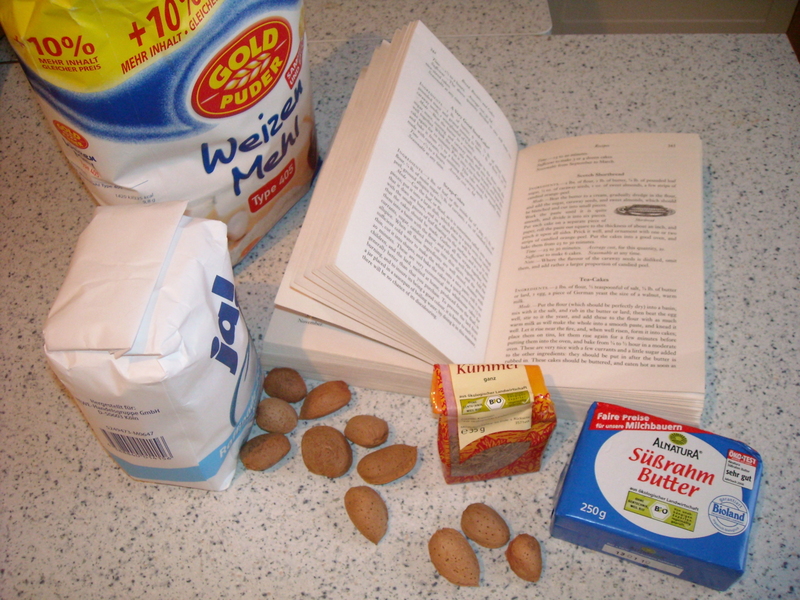 Despite nearly winding myself and losing an eye when cracking open the almonds (I bought them market-fresh, then crushed them in a pestle-and-mortar – those hardy shells make for determined missiles if cracked too energetically), all-in-all this was a supremely simple recipe to follow. The shortbread, once it had cooled down, was really delicious – delicately buttery and crumble-creamily–in-your-mouth in texture. It was, perhaps, slightly under-sweet for modern tastes, so next time I’d probably add an extra spoon or two of sugar. Otherwise, absolutely perfect. This entry was posted on December 13, 2009 at 12:26 pm and is filed under food. You can follow any responses to this entry through the RSS 2.0 feed. You can leave a response, or trackback from your own site.